Waylon Fulk was born in 1936 in Raeford, North Carolina. He enlisted in the U.S. Air Force on January 13, 1954, and was trained as a linguist before receiving his commission through the Officer Candidate School at Lackland AFB, Texas, on June 22, 1962. Lt Fulk then went through Undergraduate Pilot Training and was awarded his pilot wings in September 1963. From October 1963 to February 1966, Fulk served with the 344th Bomb Squadron at Lincoln AFB, Nebraska. He then flew C-130's with the 777th Tactical Airlift Squadron at Pope AFB, North Carolina, from February 1966 to October 1971. During his time at Pope, Capt Fulk flew missions in support of the intervention in the Dominican Republic from February to May 1966, and in Southeast Asia from June to August 1968. He was then trained as a gunship pilot and began flying AC-130 Spectre gunships with the 16th Special Operations Squadron based at Ubon Royal Thai AFB, Thailand, in October 1971. 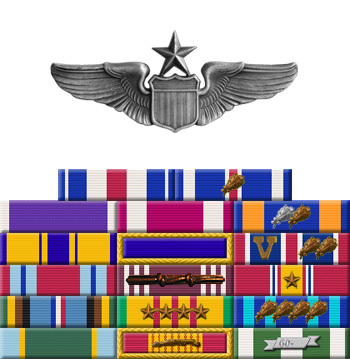 Maj Fulk flew 104 combat missions between October 1971 and September 1972, including a mission for which he was nominated for the Air Force Cross (he was awarded the Silver Star instead). After Vietnam, he again flew C-130 transports at Pope AFB, North Carolina, this time with the 317th Tactical Airlift Wing, from September 1972 until his retirement from the Air Force on July 31, 1975. 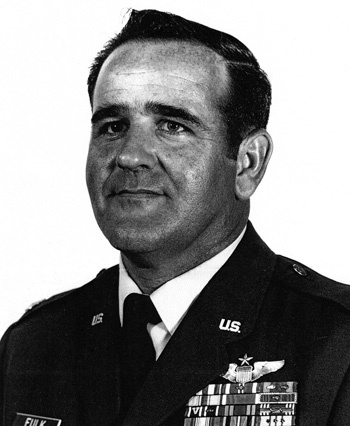 Captain Waylon O. Fulk distinguished himself by gallantry in connection with military operations against an opposing armed force over Laos on 30 March 1972. On that date, while on a night armed reconnaissance mission, his actions led to the damage or destruction of three hostile supply vehicles and the creation of four secondary fires and explosions before being struck by antiaircraft artillery fire. With the aircraft partially out of control and on fire, Captain Fulk attempted with every conceivable method to extinguish the flames and to regain full control of the crippled aircraft. With disregard for his own safety, he provided a stable platform for the crew members to safely bail out and then set the aircraft on a course away from friendly positions and bailed out. By his gallantry and devotion to duty, Captain Fulk has reflected great credit upon himself and the United States Air Force.